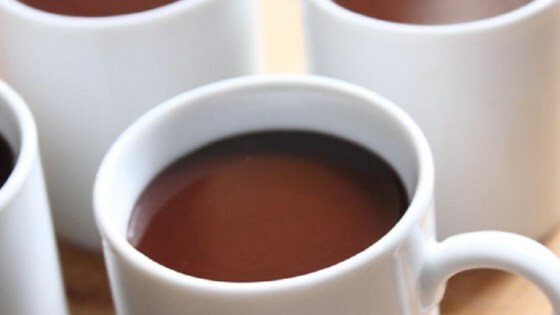 "Luckily, richer, sexier, and more decadent is exactly what this chocolate mocha pot de creme recipe is all about." Stir chocolate, instant coffee, and salt together in a medium bowl. Heat cream, sugar, and vanilla in a saucepan over medium heat, stirring constantly, until it just begins to simmer. Pour hot cream mixture over the chocolate mixture; let sit for 1 minute. Whisk the chocolate and cream mixture for 1-2 minutes until combined. Pour the mixture into four small espresso cups. Tap to remove any air bubbles. Chill thoroughly in the refrigerator for at least 4 hours. Serve topped with grated chocolate, or add lightly whipped cream and dust with cocoa powder. See the easy way to make a rich, creamy, no-bake chocolate dessert. Nutritional information does not include garnish. Instead of 70% chocolate, I used 85% and left out the whip cream as garnish and instead used more chocolate.